I was reading your eeveelutions reviews. You mention the whole “adaptations” thing isn’t really done that well, since most of them don’t really match their environments all that well. 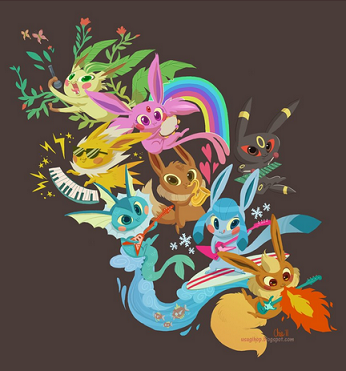 Theoretically, how would you design an octet of eeveelutions to go with different environments from scratch? I have my own but I wanna hear what you’d do first. The other thing you mention is that they go for many different aesthetics, such as cute (flareon/sylveon), cool (jolteon), beautiful (vaporeon/glaceon), and mysterious, but kind of leave off a brutish aesthetic. I would also add they leave off the under-appreciated weird aesthetic- the dunsparces and exeggcutes of the world that end up in “top 20 worst pokemon” lists but a small number of us keep close to our hearts. What catastrophically awful person puts Dunsparce on a Top 20 Worst Anything list? So, some of the eeveelutions I actually am totally fine with; I’d just associate them with different environments to their canonical ones. 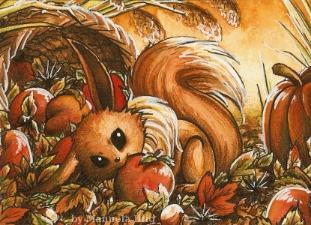 For instance, although the core games don’t say much about Flareon’s habitat, spinoffs tend to put her in volcanic or lava areas with all the other Fire Pokémon, but if we’re thinking of eeveelutions in terms of being adaptations of Eevee to a specific type of environment, well, Flareon kinda looks to me like a cold-adapted form. Thick fluffy fur is useful in a cold place, and fire powers are useful if most of the other local Pokémon are Ice-types. Alternatively, and this is what I said when I discussed Flareon for my eeveelutions series years ago, I could buy that Flareon belongs in a temperate grassland habitat, using her fire abilities to scorch areas of dry vegetation and drive out prey. Whether Pokémon in general are actually suited to the kinds of biomes the games tend to put them in… is kind of a big and complicated question and not worth getting into at the moment, but I think if you’re going to do it, Eevee is the place to start, because her lore draws attention to the concept of adaptation and (arguably) to the problems with the way Pokémon portrays adaptation. I’m starting to think Eevee might be based on the common ancestor of dogs, cats, weasels, foxes, otters, etc. Sound cool? Maybe the bunny ears symbolizes it’s evolutionary leap from herbivore into a predator. Well, the basal Carnivora probably looked something like this – much more distinctly cat-like than Eevee and probably tree-dwelling – so I think it’s highly unlikely Game Freak specifically had something like that in mind. I think conceptually they may have had ideas like common ancestors and adaptive radiation in mind – they did call her “the Evolution Pokémon,” after all. But we already knew that. Well, this puts me in a rather awkward position. 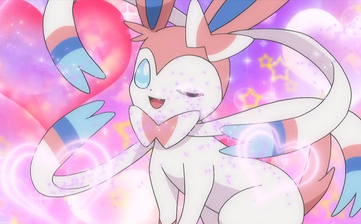 I feel like the most important thing about Sylveon is her status as the flagship Pokémon for the introduction of the Fairy type, because everything else follows from that, in a way. 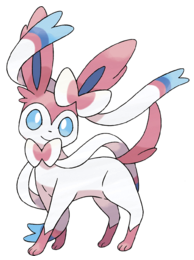 Sylveon, we remember, was the sixth Pokémon of this generation revealed (following the starters and the legendary mascots), and inevitably sparked a frenzy of speculation over her type, since type is far and away the most important feature of any Eeveelution. Normal and Psychic both seemed extremely unlikely, but nothing else really made sense, which was the first thing that got people thinking there might be a new type coming, and in retrospect it seems pretty obvious that this was exactly what Game Freak intended. In some ways, it was actually something of a troll move on their part, partly because of the people who immediately anticipated a second Eevee form to go with it, but also more generally because it prompted the expectation that generation VI, like II and IV, would include many evolutions. In fact, Sylveon was the only one – which is interesting in itself, because not evolving any old Pokémon is a major design choice for the feel of the generation and the region (probably something to do with not stealing the limelight from Mega Evolution), and breaking from that choice just for Sylveon seems important. I think it probably has something to do with their very clear desire to tie the new generation back to Pokémon’s origins, which they’ve also done by including unusually large numbers of existing species in Kalos, giving Mega forms to a large number of older-generation Pokémon (favouring I while neglecting V), handing out the first-generation starters in Lumiose city, and… well, Pokémon Origins. Making the first-revealed Fairy-type an evolution of the universally-adored Eevee, one of now eight, is a very solid way of making the new element ‘part of the club,’ as it were, smoothing over the jolt of a major change to a type chart that has remained static since generation II. 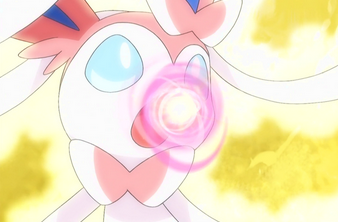 So, that’s how Sylveon fits into the grand scheme of what Game Freak are trying to do with X and Y. What is she in herself? As far as I can tell, Sylveon seems to function primarily on The Power of Friendship; she has a pacifying aura not unlike Milotic’s, and evolves from Eevee by building a moderate affection rating in Pokémon Amie, as well as learning a Fairy attack. I’m still not absolutely sure how we’re supposed to conceptualise the difference between ‘friendship,’ which prompts Eevee’s evolution into Umbreon or Espeon, and ‘affection,’ which prompts her evolution into Sylveon. Friendship is affected by a lot of things related to the Pokémon’s growth and performance in battle, so conceivably it might have more to do with trust and respect, while affection is mostly just about being pampered and fed delicious pastries, and probably represents a different sort of relationship. If we’re thinking about how Sylveon fits into Eevee’s ‘adaptation’ gimmick – the idea that Eevee’s multitude of evolutions are responses to different environmental pressures – then it seems likely that Espeon, Umbreon and Sylveon all have something to do with adapting to partnership with humans. Where Espeon and Umbreon were responses to different kinds of working partnership, though, Sylveon might be the end result of Eevee’s adaptation to life as an extremely popular and high-status pet, possibly as the result of selective breeding. What could be a greater advantage for a pet than the ability to magically cause positive emotions? This kind of power is also the defining feature of another Fairy Pokémon, Togekiss, and fits quite well with the empathic abilities of a third, Gardevoir, who also shares the unusual devotion to her trainer that gets called out in Sylveon’s Pokédex data. This might be a good thing to note down as a general theme of Fairy Pokémon, then: they can manipulate emotions, and draw strength from positive emotional relationships. Turning to her appearance, Sylveon cultivates a similar kind of ethereal grace to Espeon and Glaceon. A pastel colour scheme gives her a slightly otherworldly feel, while her ribbons flutter as though in a fey breeze. They’re not ribbons, though, they’re ‘ribbonlike feelers’ – innocuous-looking fleshy tentacle-things that channel her powers… which… to be honest is almost worse than if they’d just put inexplicable ribbons on her and said “deal with it,” because now there’s this disconcerting element of tentacle-groping creepiness to a Pokémon that I don’t think is supposed to be creepy. Then again, toss in the fact that she can manipulate emotions, and those strange, pale, glassy eyes (they almost make me want to think she’s blind, which would suddenly make a worrying amount of sense of the feelers), and the way she seems to lead her trainer by the arm, as though using her ‘feelers’ as a leash, and there’s plenty of material in there for a very sinister artistic or literary take on Sylveon, if you’re so inclined – appropriately enough for a Pokémon representative of the Fey. Not sure whether this is some kind of uncanny perfect storm of accidental weirdness or a masterfully executed double entendre. I don’t think I want to know. Quick aside: has anyone seen the argument on the Bulbapedia discussion page for Sylveon about whether Eevee’s evolved forms are feline, canine or vulpine? Wow. Such a tragic waste of good snark. In battle, Sylveon operates as a highly effective special tank, making good uses of the Fairy type’s natural blessings. All of Eevee’s evolved forms tend to be limited mainly by their extremely narrow movepools, but special tank tends to be a role that they can fill extremely well, thanks to Eevee’s access to Wish and Baton Pass, both of which are regular staples for many members of the family. Sylveon also gets Calm Mind, and has an excellent special attack base to back it up, so some form of boosted Moonblast tends to be the core of any threat she presents – and an unpleasant threat it is. All of Eevee’s evolved forms get Shadow Ball, and for Jolteon, Espeon and Glaceon it’s something of a staple because there just aren’t very many other attacks they can learn. All of them are, of course, delighted that Shadow Ball can now penetrate Steel-type defences, and Sylveon is equally pleased with this state of affairs, since Fairy and Ghost make for a very strong offensive combination – I don’t think anything resists both aside from Pyroar, who is really not a good answer to Sylveon anyway. Brutal physical attackers – ones who are not Fighting-, Dark- or Dragon-types – are good answers to Sylveon. As is typically the way with such things, the idea is to make sure you Baton Pass away before one of those shows up – ideally getting off a Calm Mind or a Wish before doing so, to heal or buff a partner. Sylveon is short on other options – again, wide movepools are not normally a strength of this family – but she does get Reflect, which could be useful in a pinch against a physical bruiser and is always nice for team support, as well as Light Screen. Psyshock is in there too if you want to catch special walls by surprise, but Shadow Ball is the better option for type coverage and taking both will leave you with little room for support options, which are always the big draws for Eeveelutions. Espeon is a lot faster and can pull Magic Bounce bull$#!t to cripple enemy supporters, but Espeon also can’t afford to take a hit from… well, anything, really, unless she’s already had a Calm Mind or two. Sylveon’s maybe not quite as cool, but is also a lot more forgiving, particularly as her poor speed makes it attractive to invest much more in her defences than you might for Espeon, and Moonblast puts her in a much better position offensively. Sylveon’s primary special ability is Cute Charm, a decidedly lacklustre ability that has a 30% chance to cause infatuation in Pokémon that make contact with an attack. To put that in perspective for you, you have roughly a 50% chance to be facing a Pokémon of the opposite gender to Sylveon, then your opponent needs to actually use a contact move, then you have a 30% chance to activate the effect, and then a 50% chance for that to stop the affected Pokémon from attacking. Coincidentally, this multiplies out to a 100% chance of Cute Charm being a dumb ability. Sylveon’s hidden ability is the far more interesting Pixilate, which transforms all Normal attacks she uses into Fairy attacks while also giving them a 30% power boost. Like its equivalents, Aurorus’ Refrigerate and Mega Pinsir’s Aerilate, Pixilate is an amazing ability, and one which Mega Gardevoir uses with relish – but Sylveon unfortunately doesn’t have any Normal-type moves worth using with it (it doesn’t help that she’s very much a special attacker – I’ve seen people suggest physical Sylveon with Curse and a super-powered Fairy-type Return, I guess for the surprise value, but… why?) unless you’re prepared to go through the hassle of getting an Adaptability Eevee on a Generation V game and teaching it Hyper Voice on Black or White 2. If you’re going to, then consider grabbing Heal Bell for more support while you’re at it. Otherwise, stick with Cute Charm. It mostly just has comedy value, but if Pixilate isn’t going to do anything, hey, why not? I think I’m sort of resigned to Eeveelutions at this point. I don’t think more are necessary or desirable, but I’m also pretty sure we’re going to keep getting them anyway, and at least in Sylveon’s case I can see the point, more or less. If there was ever a time when we needed “Eevee + type x,” it’d be now, while we’re still feeling our way around exactly what “type x” is, what it does, and how it works. On the surface she’s so much of a walking stereotype that her body actually has ribbons and bows; she’s Jigglypuff, Clefairy or Togepi poured into a quadrupedal mould. At the same time she has the potential to be slightly off-putting in several little ways that might be entirely in my head, and I’m honestly not sure whether that makes the design better or worse. In battle, she’s… well, a Fairy-type Eevee evolution with Calm Mind; that pretty much tells you what you need to know – Moonblast, small movepool, good support options. Sorry, but I’m just not inspired. 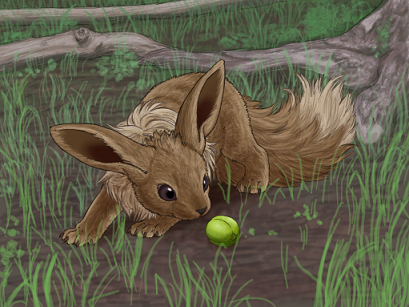 All these entries on Vaporeon, Jolteon, Flareon, Espeon, Umbreon, Leafeon, Glaceon… what about little Eevee? Doesn’t she deserve some love too? When you think about it, Eevee is actually the most important of the lot. Without her, all the rest are just generic Pokémon of their own types, for the most part; many of them are well-designed, but they’re not really all that interesting on their own. To no small extent, the thing that makes them worth thinking about is their common origin – a tiny Normal Pokémon with limitless potential. 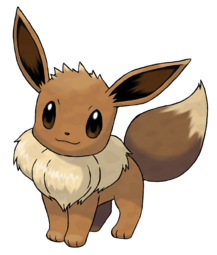 Eevee is called “the Evolution Pokémon” – indeed, the word ‘evolution’ is the origin of her name, in both English and Japanese (where she is Eievui). She pioneered the idea of a branched evolution, a concept that was originally unique to her, with her split into Vaporeon, Jolteon, and Flareon in Red and Blue. When other branching evolutions were introduced in Gold and Silver, Eevee continued to have more branches than anyone else with the addition of Espeon and Umbreon, and today she has a grand total of seven possible final forms. Eevee wasn’t just the first Pokémon to have multiple evolved forms, though – I think she actually got the whole idea spectacularly right, to an extent that subsequent Pokémon haven’t. Split evolutions typically develop different ideas of a single design, and gain their real significance when you view them together, as pairs of Pokémon, but few of them go in radically different directions the way Eevee does, and the differences between their powers and abilities are often minor. Slowbro and Slowking are probably the worst offenders – Slowbro has better physical defence, Slowking has better special defence and access to a few extra moves, and the opposition in their flavour is basically that Slowking is smart and Slowbro is dumb, because Slowking is high on Shellder venom 24/7 or something. Bellossom and Vileplume are another pair where the differences are very subtle; Bellossom isn’t a Poison-type, but they have basically the same combat roles, and although thematically they represent an interesting day-night duality, it’s not something that comes through a great deal in their designs (largely because Vileplume was created first and Bellossom added later). What all of these splits have in common is that, for the younger Pokémon who has the potential to go either way, it’s not a significant design element. Poliwhirl doesn’t care that he could evolve into either Politoed or Poliwrath. It doesn’t matter to Clamperl that she could become either a Huntail or a Gorebyss. It’s just incidental that these Pokémon happen to have a choice. For Eevee, it’s very different. For Eevee, the choice is the whole point. I believe that this is the key to Eevee’s consistent popularity throughout the franchise’s life: she offers something for everyone. Her multitude of evolved forms represent not just many elements but many ways of appealing to players; whether you like cute Pokémon or tough Pokémon, beautiful Pokémon or mysterious Pokémon, Eevee can make it happen (just about the only aesthetic type missing is a brutish Pokémon). This is a huge potential strength for the idea of branched evolutions, which most of them don’t fully exploit, and I think future designs could do some wonderful things by building on this model. One of my pet ideas, which some of you might remember from my wrap-up entry on the starter Pokémon earlier this year, is to have a game with only one choice of starter Pokémon, but to give that Pokémon a branching evolution dependent the way your relationship with it develops. Storyline-dependent split evolutions would, I think, be a very fun concept to work with and could produce a lot of cool ideas with interesting impacts on the way the games feel… but let’s get back to Eevee. The point I’m making about the versatility of Eevee’s aesthetic appeal is also at the heart of one of my problems with Leafeon and Glaceon – I think that by the time Game Freak got around to adding Grass and Ice versions of Eevee, most of the possibilities for aesthetic development had already been exhausted. Leafeon’s wide, alien eyes and foliage-covered body produce an aura of mystery and otherworldliness similar to that cultivated by Espeon, while Glaceon’s sleek, beautiful form shares a great deal with Vaporeon in terms of design goals. I don’t think adding Leafeon and Glaceon was necessarily a mistake. They could have been done well. The problem is that, traditionally, Eeveelutions don’t have a whole lot of variety or detail other than those basic design choices and their elemental affiliations – their powers are typically very standard fare, and most of them don’t have particularly interesting behavioural traits or personalities. As a result, they’re interesting only within the context of their family, not as independent Pokémon themselves. Even this doesn’t have to be a bad thing, I should emphasise – because, of course, we always will view them as a part of that family – but it does, in my view, place a limit on how effective any future additions can be. There are enough of them now that the essential point has been made already. Someone asked me a few days ago which of the remaining ten elements I would most like to see used for a new Eeveelution. Honestly this is one of those times where I have to begin my answer with “actually, I wouldn’t, but since you ask…” After Leafeon and Glaceon, I think that continuing to add more would be rather labouring the point. Eevee has more evolutions than any other Pokémon in the game, allowing her to express interesting themes of adaptability and diversity. Most of the evolutions themselves are not especially interesting in isolation, and are more valuable for being part of that wider idea. Why add more? Only if you can do something different, something that casts a whole new light on the themes established by the existing members of the family. Let’s talk about those themes for a bit because they’re important. Evolution, as defined in the Pokémon universe, is of course a very different thing from the kind of evolution we talk about in modern biology, but in Eevee the two are fortuitously united. Real evolution, of the kind first outlined in Charles Darwin’s On the Origin of Species, is the barely perceptible change of species (not – and this is important – individuals) over the course of generations in response to environmental pressures. It does not aim in any direction. It doesn’t make species stronger or faster or smarter. It only makes them better suited to specific sets of environmental conditions. The contrast with Pokémon evolution, which operates within an individual’s lifetime and (with a few notable exceptions) normally does make them stronger, faster, smarter and (again, with a few notable exceptions) larger, is obvious. Eevee acknowledges the real-world concepts of evolution with her great spread of possible evolved forms – none of them superior or inferior (well, yes, okay, we all know Flareon is rubbish and Espeon is ridiculous, but it doesn’t seem like the designers intended for things to work out that way), merely different, and better adapted to different roles and different lifestyles. At the same time, though, Eevee is still ‘evolving’ like a Pokémon, changing within her own lifetime to reflect the environment around her (this is actually more similar to the alternative, now discredited, model of evolution once proposed by Jean-Baptiste Lamarck, and I am becoming convinced that species of Pokémon actually develop by Lamarckian evolution – Google it; it’s fascinating stuff). This creates a fascinating contrast, which is why I’ve been so interested in probing the environmental conditions that lead to each of Eevee’s evolved forms, and why I think this is the aspect of the design that Game Freak should be focusing on in the future – it doesn’t just have the potential to tell us some fascinating things about all Pokémon, it could even be educational too! The problem – and it’s one I’ve been trying to work around as I go – is that the designers’ level of commitment to this concept doesn’t seem to have been constant all the way through. In particular, their use of the theme of environmental adaptation is rather haphazard. As I mentioned in Glaceon’s entry, it makes sense to us on a certain level that Pokémon in hot places should fight with fire, and Pokémon in cold places should fight with ice, and Pokémon that live in forests should act like plants, and so on, because we expect them to take on the traits of the things around them. When you think of it from an ecological standpoint, though, it starts to get quite odd. 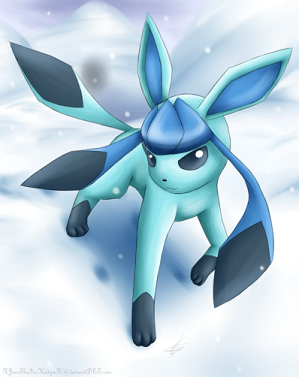 It makes sense for Glaceon to resist cold, because she lives in cold places, but does it make sense for her to use the cold, when everything around her will resist cold as well? Conversely, it makes sense for Leafeon to be able to use the plants around him, since he’s a jungle Pokémon, but does it make sense for him to adopt a lifestyle that leads him into direct competition with all those plants? This is the reason I don’t place Flareon in a volcanic environment, even though this is something of a standard choice for Fire Pokémon – of course the fire-based creatures that live there already, like Slugma or Magmar, would innately be able to use fire, but if you were a Normal-type moving into a place like that, what survival advantage would be conferred by gaining fire abilities? In the end, of course, a complete ecology of the Pokémon world is a long way off – if there’s even any possibility it will ever happen at all – but I think looking at Eevee in a more critical light might be a good place for any such project to start. Let’s return to that question I was supposed to be answering. What else could you evolve Eevee into? Ground, Rock, or Fighting? They would be obvious choices for filling that one remaining aesthetic niche, but I’m not sure the idea of a brutish Eevee is necessarily one that would achieve any particular appeal. Poison? What thematic aims would be served by creating a poisonous Eevee? Flying, Bug or Dragon would be… odd, put it that way. They would make our new Eeveelution very much an odd one out in the Field egg group, since those three types are some of those that map most closely onto corresponding breeding groups, and they also raise some concerns about what environmental stimulus, exactly, would prompt Eevee to sprout wings or additional legs. Ghost could potentially bring up some points about Eevee’s interaction with humans, but I’m not convinced you could do anything with it that Espeon and Umbreon didn’t. I’d prefer to leave Steel out of it, because that’s getting perilously close to drawing human modification into things, which I worry would rather miss the point. In fact I think there’s really only one type you could do anything interesting with if you wanted to make an eighth evolved form for Eevee. It’s Normal. All the other forms focus on shedding Eevee’s flexibility in exchange for becoming supremely well-adapted to a particular environment; a Normal-type evolution could instead look at the idea of retaining that adaptability; instead of having the narrow movepools that signify the specialisation of the other forms, she could use a wide selection of moves to act as a ‘jack of all trades, master of none’ type character (something like, say, Clefable or Mesprit, except that it would be the whole point of the design rather than an unintended result). I might abandon the traditional Eeveelution stat spread as well, and give it flat average stats across the board, just to ram the point home. This is a Pokémon that travels widely and can live anywhere. It can’t settle down and really force other species out of their permanent niches, but it can get by in just about any environment. As a result, it’s both adventurous and capricious, preferring not to stay in one place for too long, and, like humans, prizes wide knowledge and varied experiences. The unfortunate weakness to this design is that I really have no idea where I would take its art – all my concerns about retreading old ground still stand, and I’m not especially wild about the obvious route of just creating a bigger, fluffier Eevee either. The point I am by slow degrees trying to make here is that Eevee, in my opinion, is a fascinating Pokémon, who can provide some interesting lessons in design that haven’t really been appreciated or explored, even by her own more recent family members. Her massive popularity (and that of her older siblings) isn’t just a question of cuteness, because of course Eevee is cute, but there’s nothing really to recommend her over the legions of other cute Pokémon out there. She succeeds because she can be many things to many people. If you love your Eevee, she will grow with you, reflecting your own ambitions and your own choices – and that, when it comes right down to it, is what Pokémon is all about. So, if you read my entry on Leafeon all the way to the end, you may have gleaned that I don’t particularly think much of Glaceon either. It’s nothing personal. I actually have a certain affection for Glaceon; she’s pretty cute, as Ice-types go, and she’s not exactly a terrible Pokémon either. On sober reflection, though, I think she’s rather bland, and, much like Leafeon, struggles to develop an aesthetic or competitive niche within her large family. Wait. Go go gadget Pokédex. Game Freak, are you seriously telling me you got so lazy that you stole Jolteon’s flavour text? Yes, that is exactly what they are telling me. What’s more, because it worked so well for Jolteon, they chose to represent this power in game with a silly little move that no-one will ever use (I don’t care how badly you need a priority attack) because Glaceon’s physical attack stat is appalling – Ice Shard. Unlike Jolteon, Glaceon doesn’t really look like she has any business using an attack like this, probably because it’s something that was pasted on at the last minute and not an actual part of the design. I’m sorry, but if this doesn’t say “we ran out of ideas” then I don’t know what does. Glaceon’s elegant and beautiful like Vaporeon, sure, but Vaporeon is a creative hybrid of terrestrial and aquatic features, whereas Glaceon is just a nice shade of cyan. She has magical freezing abilities, but so do most other Ice Pokémon. I don’t think I would be upset with this design if I thought there were an evolution on the way; it feels incomplete, as though it’s waiting for elaboration, and detail… but no; Glaceon is the evolution. I find myself without any reason to care about her. 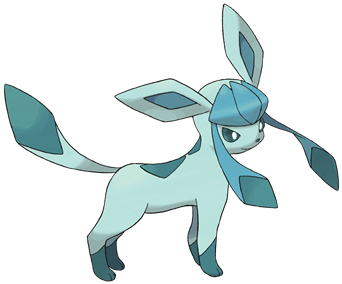 As with Leafeon, Glaceon’s method of evolution makes it obvious what kind of environment she’s meant for (if her icy powers weren’t already enough of a clue) – set off by the Ice Rocks found near Snowpoint City in Sinnoh and beneath Twist Mountain in Unova, Glaceon is a cold-adapted Eevee, at home in alpine and boreal forest terrain. It’s strange that she doesn’t seem to have any of the features normally associated with cold-adapted species, like large size (to reduce your surface area to volume ratio) and thick fur (for insulation), but I suppose many of the normal rules for living in cold climates go out the window anyway for Glaceon and for several other Ice Pokémon, who are actually colder than their surrounding environments. Glaceon fights by chilling the air around her, so for her a high surface area, and hence small size, makes sense to maximise her ability to drain heat from the atmosphere. Glaceon and Leafeon are the first Eeveelutions to really embrace the idea that Eevee’s unusual properties are a result of her adaptability, which is great, because it’s a fun idea that gives Eevee and her weird split evolution a great deal of significance and some interesting implications. However, they also neglect to do much of anything with the idea. Forest Eevee is a Grass-type, alpine Eevee is an Ice-type; they take on the characteristics of the environment that they live in… but this leads to Leafeon competing with tall trees for light to photosynthesise, and Glaceon using cold attacks to defend herself from other cold-adapted species. This is a slight problem that hides beneath a lot of Pokémon, but we tend to ignore it because there’s a certain intuitive rightness about it. When you set up a species as ‘the adapter,’ though, it draws attention to the fact that it doesn’t actually make a lot of ecological sense for Pokémon to adapt in this way and develop these powers… more on that next time, though. As far as battles go, Glaceon has one big, important selling point: she commands the most powerful Ice attack in the game (barring legendary Pokémon), a devastating Blizzard which, backed up with Hail to boost its accuracy, will level just about anything that doesn’t resist it. Realistically, Ice Beam is a lot more reliable, and will still hammer the opposition pretty severely. This, sadly, is where the good news ends. Ice is a great offensive type, hitting four other elements for super-effective damage, including Dragon. However, it is also hands-down the worst defensive type in the game, sporting only a single resistance (to itself). This would not be such a problem if Glaceon were set up as a sweeper, but she isn’t – she’s actually quite slow. Her greatest assets, after her monstrous special attack, are her defence and special defence, which, in combination with her poor HP, are good but not amazing (to be fair, she can boost her physical defence with Barrier and retaliate against special attacks with Mirror Coat, but that takes time and moveslots). Glaceon will face a lot of hits from faster Pokémon as she attempts to freeze-dry her way to glory, and although she’s pretty bulky for an attacker, the lack of resistances makes it very difficult for her to handle repeated assaults. It also reduces her suitability for using all the neat little support moves that her family has access to, like Wish, Baton Pass, Heal Bell and Yawn. The other major problem for Glaceon is that, like all her brothers and sisters before her, her offensive movepool is quite small. After Ice Beam, she’s got Shadow Ball and Signal Beam, which are helpful but don’t have a lot of power and are from fairly weak elements – and the truly damning thing is that, if she wants to manage neutral damage against most Steel-types, she has to resort to the decidedly lacklustre Water Pulse (available from a 4th-generation TM). Basically, she has the wrong stats and movepool for a sweeper, the wrong type for a tank, and no other viable choices. 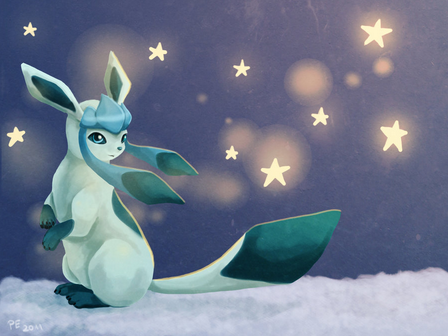 As far as I can tell, Black and White didn’t do much for Glaceon… if anything. The new move tutors in Black 2 and White 2 seem to have added Hyper Voice to her movepool, along with those of all the other Eevee evolutions; I haven’t mentioned it in any of their entries because Normal attacks are generally less than stellar choices, but Glaceon is so desperate for weapons that it might be worth a shot. Frost Breath, a weak Ice attack that always scores critical hits, is amusing against anything that favours Calm Mind or Amnesia but substantially weaker than Ice Beam otherwise. Her abilities aren’t much help either; both improve her staying power in Hail, but weather strategies can be tricky to pull off at the best of times, Hail is easily the hardest to build a team around, and as we’ve already seen Glaceon has problems trying to act as a tank anyway. Snow Cloak grants a helpful but unreliable 20% evasion chance (potentially good for use with Double Team, but Double Team is often frowned upon for its emphasis on luck); you’re probably better off with Ice Body, which lets Glaceon slowly regenerate in Hail, but that does invite rather unfortunate comparisons to Walrein, who does the same thing about a million times better. The really sad thing is that Glaceon isn’t even the only member of her family with powerful Ice attacks, because the rule that Water-types can use Ice moves seems to override the rule that Eevee’s evolutions aren’t allowed diverse offensive movepools. Vaporeon’s Ice Beam is a lot weaker than Glaceon’s, naturally, but it’s also not the only thing she’s good at. That, for me, sums up Glaceon’s problems; she simply doesn’t do anything special. The designers seem to have decided that they needed a seventh evolved form for Eevee, but neglected to develop any sort of conceptual basis for what they were creating. The end result is “Eevee, only blue and chilly,” which is a real pity because Ice is a fun type to work with and think about, and there’s nothing wrong with the idea of an Ice-type Eevee… it’s just not enough on its own. 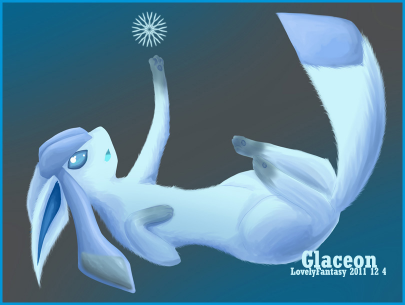 Glaceon is just another of those Pokémon who needed a little more thought, never got it… and probably never will.